Jobst Relief Thigh High Compression Socks with Silicone Top Band OPEN TOE 30-40 mmHg are exceptional compression socks manufactured specifically for people with CVI and DVT. 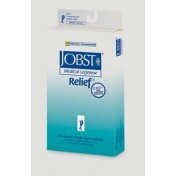 Relief by Jobst provides great quality and features an open toe design. The reinforced heel on the Compression Stockings 30-40, available for men and women, also gives you increased durability. Thigh High Compression Stockings are made with a silicone top band that helps the stocking stay up the whole day. These stockings also help cover veins, scarring, skin blemishes, and help control lymphedema. Love these! Long enough, they stay up and work great. I have chronic lymphedema and have used many different types of compression stockings but these are by far the best. I'm a tall girl with long legs and these are the only ones I've found that go all the way up to the top of my thigh. The top band is wide enough that it doesn't dig into my leg and cut off the circulation. They stay up and provide great relief. They are opaque but not terribly so. I wear them all day every day and a pair lasts me a couple months. I rarely ever get a run and typically only if I snag it on something. They are tight but, they're meant to be but, off all the stockings I've tried, I find these to be the easiest to get on. I'm sure everyone will have their own preferences, but I've been buying these lately for there price and comfort. I've needed support stockings for the last 25 years and have tried most brands, and these are as good as any.